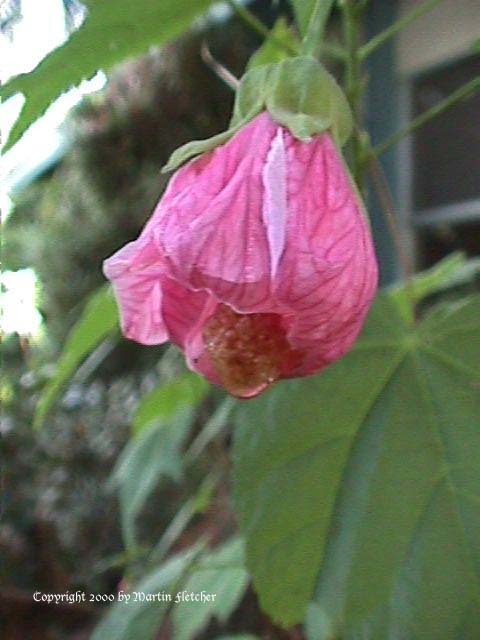 The leaves on this pink variety of Abutilon are about twice the size of the other Abutilon's and much less hairy. This shrubby Abutilon can get quite large. I have spent considerable amounts of time chopping the Pink Abutilon back to stay within 10 foot by 10 foot space when it thinks it is happy. They can be damaged by frost in the low 20's F. Hummingbirds feed from the Chinese Lantern flowers by reaching in between the sepals and petals to seek out the nectaries.